Dr. Stefan Holz is in charge of one of the fastest-improving and growing leagues in Europe. Where will he take it from here? The Beko BBL is still considering sending their league winners to the FIBA Champions League instead of the Turkish Airlines Euroleague, according to league boss Dr. Stefan Holz, who also says the league needs to reach out to fans of the NFL and wrestling while the clubs need to have more ambition. “We are still talking with both sides,” Dr. Holz said on the Taking The Charge podcast on heinnews.com. While Dr. Holz said the Euroleague is a fantastic product, he did say there are pitfalls and areas where the Champions League is a better fit. “Friday is very difficult as a game day for our league. And other questions. FIBA Champions League in the second approach is definitely an attraction following the football Champions League where it’s not a closed shop but a qualification only by sports criteria, meaning champion and maybe runner. And the game day is Wednesday and not a fixed league with 30 games and playoffs. These are also important points and these are going in the right direction for FIBA,” Dr. Holz said. The BBL boss said the league is also involved in the talks and workshops in designing the Champions League and “not just waiting for the results”. Dr. Holz said a clear competition model from FIBA is expected in the very near future. “And then we will decide,” he said. Dr. Holz discussed a number of other issues concerning the league, including a new league main sponsor, its target audience and clubs needing to be more ambitious. Another of the new CEO’s biggest up-coming tasks is to find a new league main sponsor after Beko declined to pick up the extension option on its expiring contract with the league. In previous reports in the German media regarding the league’s main sponsor, there have been mentions of official timekeepers, soft drink companies and beer partners as possible future sponsors for the league – in areas other than main league sponsor as well. “We’re looking for big brands, big corporations who understand basketball, who understand our target group, who believe in our growth, who believe in our vision and want to be part of this. This is a big challenge,” he said. Dr. Holz summed up the search as trying to “find a new Beko”. The mention of China is especially interesting considering firstly that having a connection to China would mean a strategic placement in the enormous Chinese market for the German league. Chinese companies are also investing more and more in the German football Bundesliga and its clubs. And Alba Berlin in November 2014 became the first European basketball team to have a Chinese company as a main sponsor when they agreed to a three-year contract with the ZhongDe Metal Group – though Alba remains the title sponsor of the club. Another goal for Dr. Holz and his team is to grow the league, and the marketing expert explained how the BBL will explore ways to reach its target group – 14-29 year old males. “It’s only marketing. We have to be there where our target groups are. It’s very simple. We are a brand and we have to be where our people are. We have to get in touch with music, with hip hop with young lifestyles. When you look for 14-29 year olds in German sports – other than football/soccer – the main areas you can find them, according to Dr. Holz, are NFL and wrestling. “The NFL is exploding in Germany the last one or two years,” he said. Two NFL games are being shown live Sunday on the German television channel ProSeiben MAXX. He also said the Beko BBL target group is watching wrestling. “We know that wrestling has a big following too. There’s a wrestling tour. They had a sold out event at the Cologne Arena with 18-20,000 people. It was sold out within days. Another area of concern that Dr. Holz would like to address is an apparent lack of high aspirations for the league’s clubs. Before the first game of the season – the German Champions Cup between league winners Brose Baskets Bamberg and cup champs EWE Baskets Oldenburg – there was a league media day in which the clubs presented their season goals and at least eight of the BBL teams said their number one goal was to avoid relegation to the ProA. 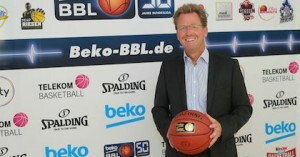 Four months into his job, Dr. Holz realizes there’s still plenty of work to do for the Beko BBL.